The arrival of the Great White Fleet at San Francisco (May 6, 1908). ﻿The Great White Fleet was the popular nickname for the United States Navy battle fleet that completed a circumnavigation of the globe from December 16, 1907 to February 22, 1909 by order of U.S. President Theodore Roosevelt. 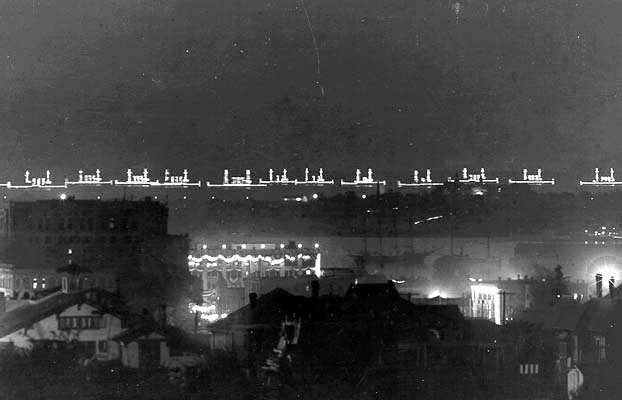 It consisted of 16 battleships divided into two squadrons, along with various escorts. 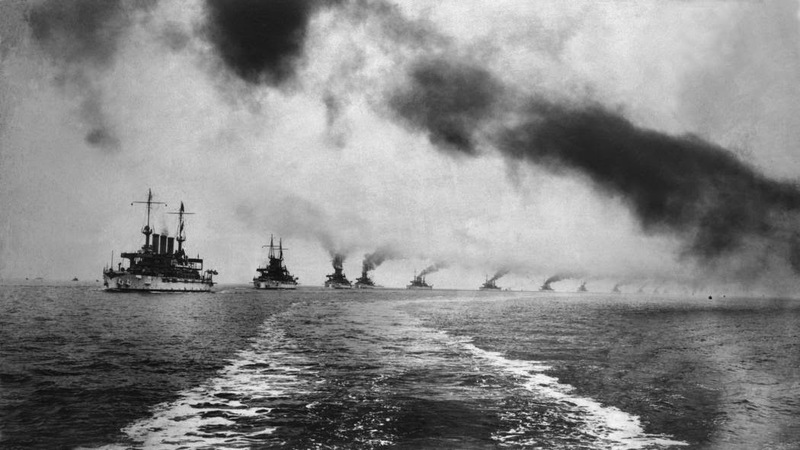 Roosevelt sought to demonstrate growing American military power and blue-water navy capability. Hoping to enforce treaties and protect overseas holdings, the U.S. Congress appropriated funds to build American sea power. Beginning with just 90 small ships, over one-third of them wooden, the navy quickly grew to include new modern steel fighting vessels. The hulls of these ships were painted white, the Navy's peacetime color scheme, decorated with gilded scroll-work with a red, white, and blue banner on their bows. These ships would later come to be known as the Great White Fleet. 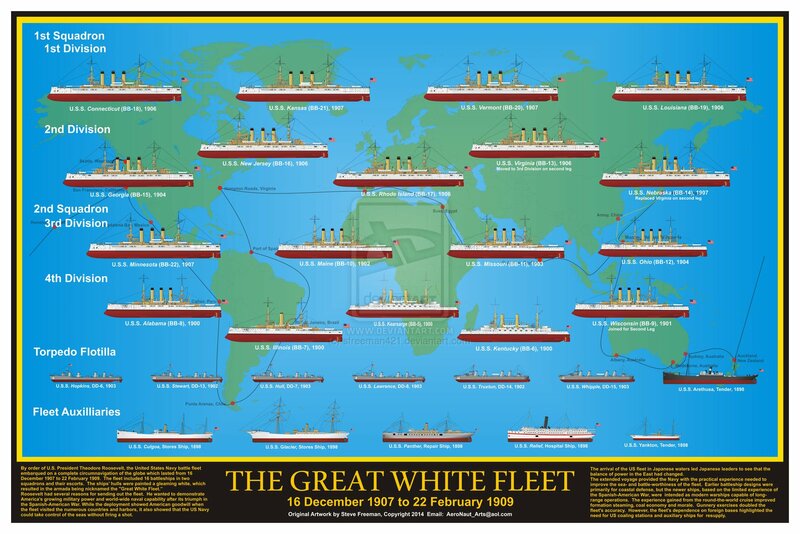 Click to enlarge and save the image to view the details: The Great White Fleet by Steve Freeman (sfreeman421 for deviantart). For a higher resolution image click here. 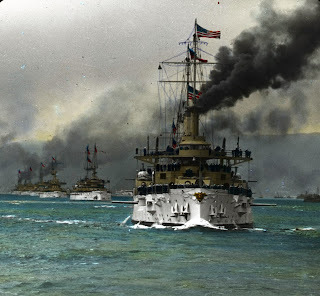 ﻿The cruise of the Great White Fleet provided practical experience for US naval personnel in sea duty and ship handling. It also showed the viability of US warships for long-range operations as no major mechanical mishaps occurred. However, while the cruise uncovered design flaws, it did not test the abilities to engage in battle fleet action. 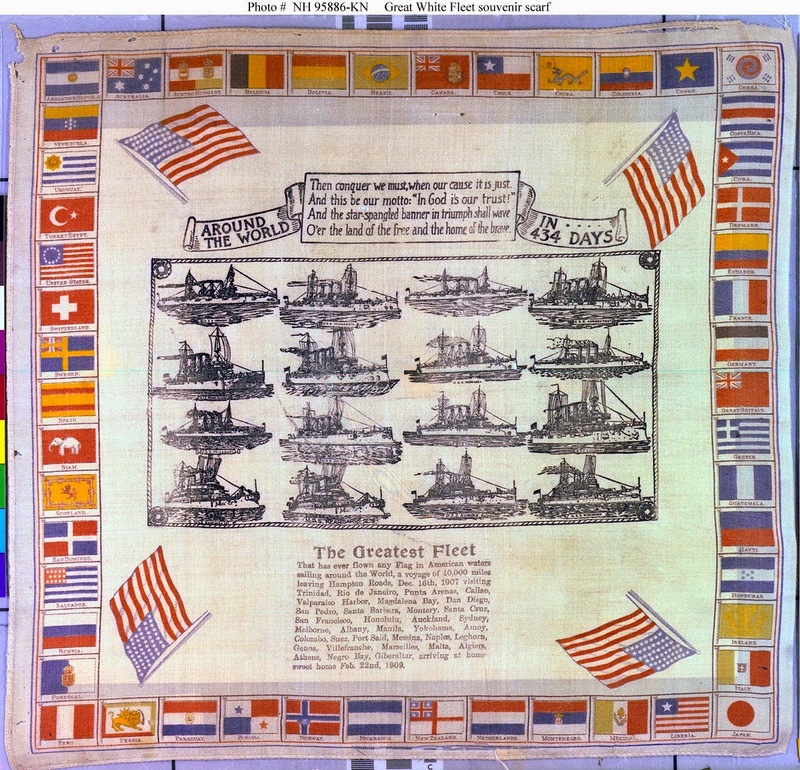 In fact, the success of the deployment might have helped obscure design deficiencies that were not addressed until World War I. These included excessive draft, low armor belts, large turret openings and exposed ammunition hoists. For more details about the voyage, the commanders and the port-calls click here.